Atlantic herring (Clupea harengus) are oceanic, plankton-feeding fish that occur in large schools and inhabit coastal and continental shelf waters from Labrador to Virginia. Juveniles (called sardines) undergo seasonal inshore-offshore migrations. Sardines are abundant in shallow, inshore waters during the warmer months of the year. Adults (age three and older) migrate south from summer/fall spawning grounds in the Gulf of Maine and Georges Bank to spend the winter in Southern New England and the Mid-Atlantic. Herring spawn as early as August in Nova Scotia and eastern Maine and during October and November in the southern Gulf of Maine, Georges Bank, and Nantucket Shoals. Spawning habitat consists of rock, gravel, or sand bottoms, ranging in depth from 50-150 feet. Females can produce between 30,000 and 200,000 eggs each. Schools can produce so many eggs that the ocean bottom is covered in a dense carpet of eggs several centimeters thick. Eggs hatch in 10-12 days depending on water temperature. By their fourth year, fish are about 10” in length and may eventually grow to about 15” (1 ½ pounds) by 15 to 18 years old. Herring are filter feeders preying entirely on plankton. They usually feed at night following the massive vertical migrations of zooplankton that inhabit deep waters by day and surface waters by night. Atlantic herring are one of the most important species in the Northeast because of the vast role they play in the marine ecosystem and their importance to fishermen. Herring form the base of the food web as a forage fish for marine mammals, seabirds and many fish throughout the Mid-Atlantic and Northeast. Schooling herring serve as an important prey resource for migrating whale and dolphin populations on which eco-tourism activities, such as whale watching, depend. Atlantic herring also provide effective and affordable bait to lobster, blue crab and tuna fishermen, and are sold as canned sardines, steaks and kippers. They are also a valued commodity overseas where they are frozen and salted. 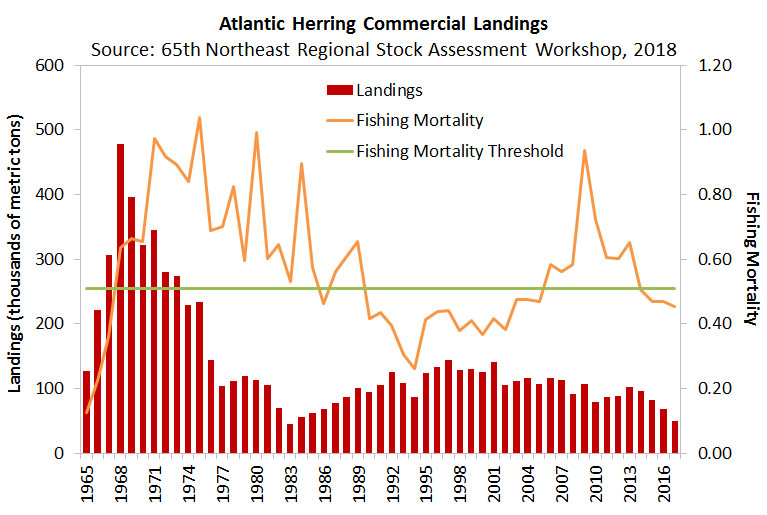 Since 2000, the ex-vessel value of commercial herring landings has averaged about $30 million/year. The commercial herring fishery in New England developed in the late 19th century, spurred by the development of the canning industry. The lobster fishery developed about the same time, creating a market for herring as bait. 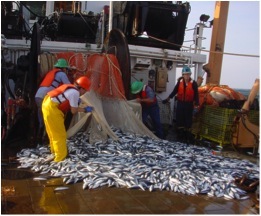 Commercially landed herring are caught using purse seines and mid-water trawls. Catch in the Atlantic herring fishery increased in the 1960’s, peaking in 1986 at 477,767 mt (1.05 billion pounds), largely due to a foreign fishery which developed on Georges Bank. Catch declined in the 1980’s and averaged 78,164 mt (172 million pounds). Landings in the 2000’s were fairly stable around 113,358 mt (250 million pounds) but have decreased over the last four years to 50,250 mt (111 million pounds) in 2017. The 2018 Benchmark Stock Assessment, conducted by the Northeast Fisheries Science Center, provided an updated picture of stock health. 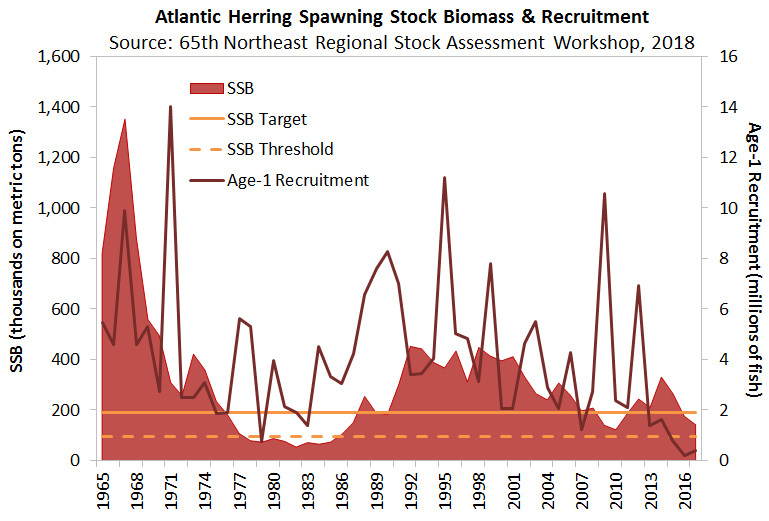 While Atlantic herring are not overfished and overfishing is not occurring, the report highlighted concerns about trends in recruitment and spawning stock biomass. Recruitment, a measure of how many herring are born into the population, has been below the time series average for the last five years. In particular, 2016 recruitment was the lowest on record at 1.7 million fish. While recruitment has been variable throughout time, recent and continuing low levels of recruitment indicate that there will be fewer fish available to harvest in future years. Spawning stock biomass (SSB), the portion of the population that is reproducing, has also been lower in recent years. In 2017, SSB was estimated at 141,473 mt, below the SSB threshold of 189,000 mt (417 million pounds). Fishing mortality has decreased in recent years, with a 2017 level of 0.45, below the fishing mortality threshold of 0.51. The data used in the assessment came from both fishery-dependent and -independent data, incorporating commercial landings and relying on the NEFSC trawl survey. The Commission manages Atlantic herring under Amendment 3 to the Interstate Fishery Management Plan, which was approved for management in February 2016 and implemented on June 1, 2016. The Amendment refines the spawning closure system and modifies the fixed gear set-aside. The Amendment consolidates prior amendments (and associated addenda) and recent management decisions into a single document; it is now the comprehensive document for Atlantic herring management in state waters. through Area 1A must have all gear stowed. In October 2018, the Board initiated Draft Addenda II and III to Amendment 3 to consider strengthening spawning protections in Area 1A (inshore Gulf of Maine) and extending spawning protections to Area 3 (off of Cape Cod and Georges Bank), respectively. This action responds to the results of the 2018 Benchmark Stock Assessment and aims to promote stock rebuilding. In February 2019, Draft Addendum II was approved for public comment. The Draft Addendum considers extending the length of the spawning closures as well as altering the point at which closures are triggered in order to provide greater protection to the stock. Due to concerns regarding projected substantial declines in herring biomass, the Council and the Commission approved for the 2019 fishing season set the ACL at 33.2 million pounds (15,065 metric tons). The ACL is further subdivided by the Atlantic herring management areas as follows: Area 1A = 9.6 million pounds, Area 1B = 1.43 million pounds, Area 2 = 9.2 million pounds, and Area 3 = 12.96 million pounds. After adjusting for the research set-aside, the 39 mt fixed gear set-aside, and the 8% buffer (Area 1A closes at 92% of the sub-ACL), the Area 1A sub-annual catch limit (sub-ACL) is 8.489 million pounds (3,850 mt). The Area 1A sub-ACL is further distributed among four quota periods as follows: Period 1 – June (16.1%); Period 2 – July-August (40.1%); Period 3 – September-October (34.0%); and Period 4 – November-December (9.5%). Directed fisheries within a management area close when 92% of the sub-ACL has been harvested, and the stock-wide fishery closes when 95% of the ACL is projected to be reached. In April 2019, the Atlantic Herring Management Board member states of Maine, New Hampshire and Massachusetts set zero landing days for Period 1 and rolled over the Period 1 quota into Period 2. More information about 2019 Area 1A effort controls can be found in the link below. Days out is the primary effort control measure for the Area 1A fishery. States involved in the Atlantic herring fishery are allowed to extend the fishery by controlling fishing effort (fishing days) through landing restrictions. The goal is to provide a consistent supply of herring to the market by controlling landings, participially early in the season when herring may be localized in Area 1A. Maine, New Hampshire and Massachusetts continue to modify days out of the fishery during the season to prolong the fishery in Area 1A. making herring available during peak demand. The current status of days out of the fishery is below. Atlantic herring captured as part of the Northeast Fisheries Science Center's (NEFSC) Pelagic Trawl Survey. Photo credit: NEFSC. The three inshore Atlantic herring spawning areas of eastern Maine, western Maine, and Massachusetts-New Hampshire have independent closures during the fall that may begin on the default dates of August 28, October 4 and October 4, respectively. Actual closure effective dates are determined using a GSI30-based forecast system. This method was developed by the Technical Committee, then tested and evaluated for effectiveness during the 2016 fishing season. The GSI-based spawning monitoring system tracks reproductive maturity to align the timing of spawning area closures with the onset of spawning. The modeling efforts to forecast the spawning closures are available at http://www.massmarinefisheries.net/herring/.